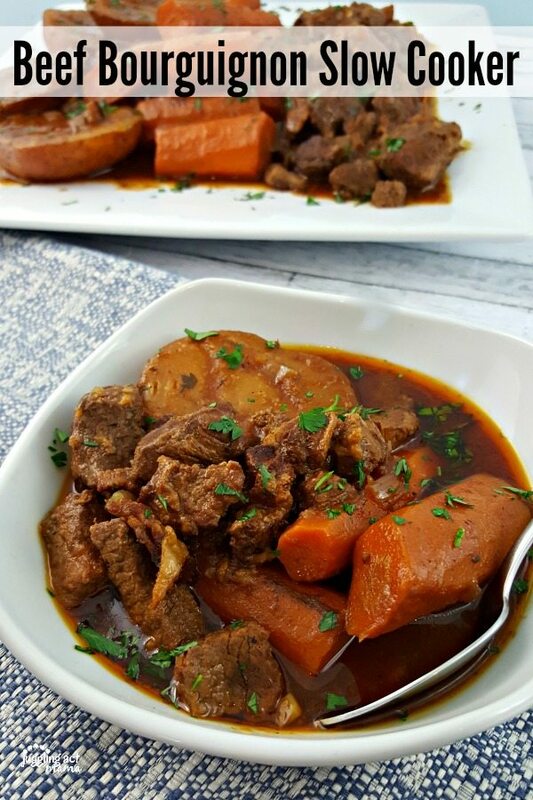 My Beef Bourguignon Slow Cooker recipe, with hearty vegetables and tender meat, is just the thing for a cold New England night. 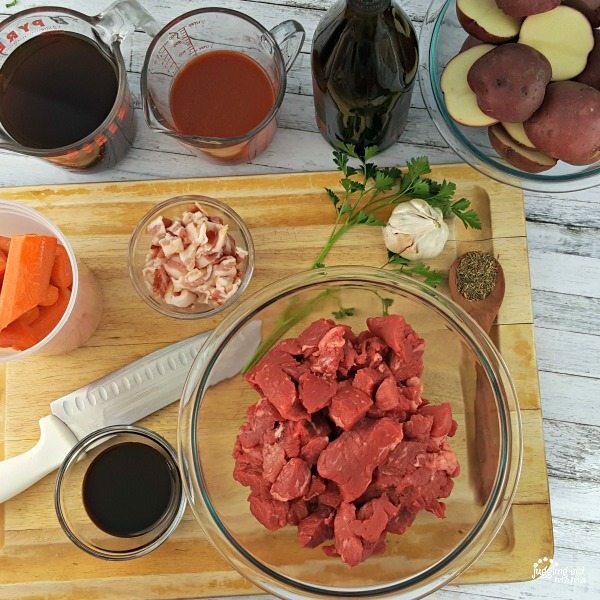 Loaded with deep rich flavor, this hearty Beef Bourguignon Slow Cooker recipe will soon be a family favorite! Sundays were made for cooking comforting meals, don’t you think? It may be sunny out, but that doesn’t mean it’s warm. Here in New Hampshire, the mornings are still brisk and the evenings can be downright frigid. Last weekend, I pulled my favorite sweater over my head and decided to make this recipe that I’d been pondering for quite awhile. In my mind, Beef Bourguignon was too fancy for me. But in reality, it is basically a fancy beef stew. Unlike it’s more humble cousin, this recipe has a few extra steps, but you can’t argue with the results. It’s all about building layers of flavor. 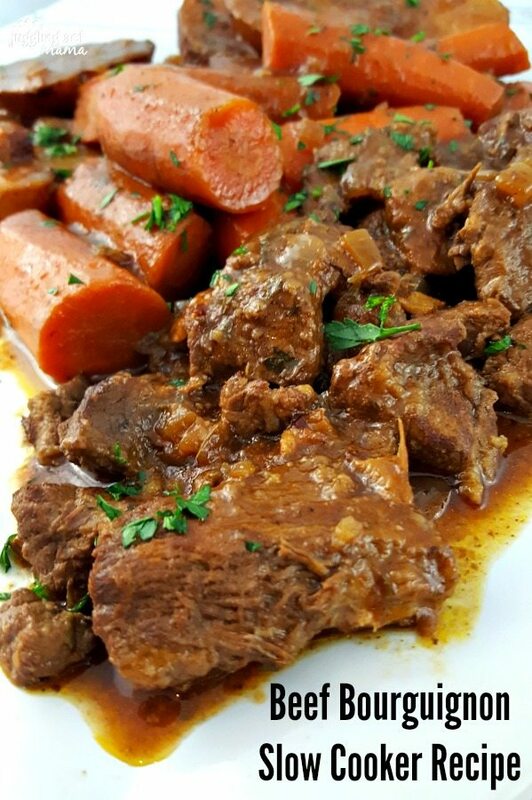 Making a Beef Bourguignon Slow Cooker variation is perfect for busy families, because you don’t have to babysit a dutch oven all day. I know that this list looks overwhelming, but stay with me on this… I promise it will all be worth it in the end! Cook the bacon pieces until crisp. Move the bacon to the slow cooker. Toss the beef with the flour. Season with salt and pepper and half the ground thyme. Sear the meat in the hot skillet. Remove to the slow cooker. Add the butter to your skillet and cook the onions until translucent. Season with salt and pepper. Add the garlic and cook 1 to 2 minutes more. Add the red wine to the skillet. Because the slow cooker is sealed, the alcohol doesn’t burn off as much. The liquid also helps get any of those delicious brown bits off the bottom of your pan. Simmer and let the wine reduce by a third. Add the beef stock, tomato sauce and Worcestershire sauce and bring back up to a simmer. Stir in the tomato paste and the remaining thyme. Cook 1-2 minutes more while the sauce thickens. Layer the potatoes on top of the meat, then add the carrots on top of the potatoes. Pour the mixture into the skillet over all the ingredients in the slow cooker. 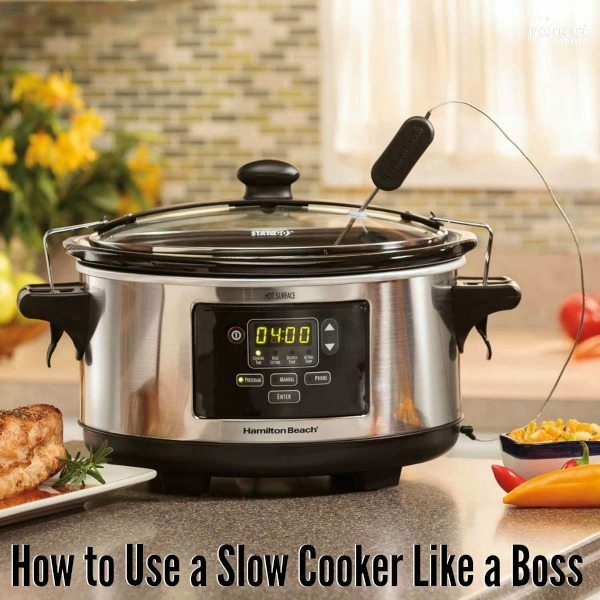 Set the slow cooker to LOW for 8 hours. Garnish with fresh parsley, if desired before serving. 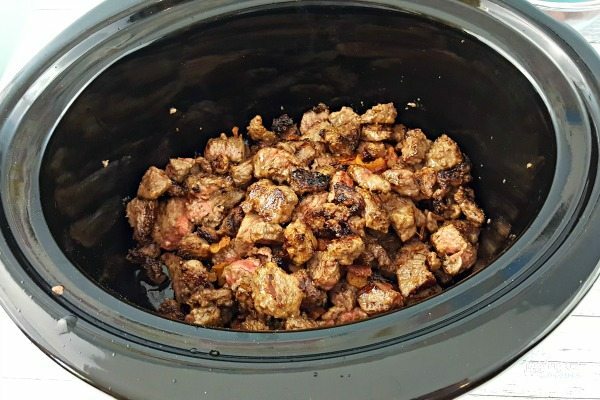 Pour the mixture into the skillet over all the ingredients in the slow cooker..
Another great Sunday Super idea is Beef Tips and Gravy – be sure to check out that recipe, too! Searing the Meat: You are only looking to sear the meat, not cook it through. Put it in the pan and don’t touch it for a couple of minutes so that it can get a nice deep rich flavor. The more caramelized your meat is, the more depth of flavor your dish will have. Don’t Skip the Wine: The wine helps build on your layers of flavor. You can reduce the amount if you like, but don’t skip it altogether. If you follow the recipe, the alcohol in the wine will cook off and you’ll be left with just the richness. Give it Time: In my opinion, this recipe does better if you cook it on low for about 8 hours. If you don’t have that much time, chop your potatoes and carrots smaller, then set your slow cooker to High. Cook it for 4-5 hours until your beef is tender. Which Red Wine is Best for Beef Bourguignon? Typically, a red Burgundy wine was used in this recipe, which is really just a Pinot noir. Any dry red wine will work, just remember that you need to let the alcohol cook off because in slow cooking there isn’t enough evaporation for it to cook off. 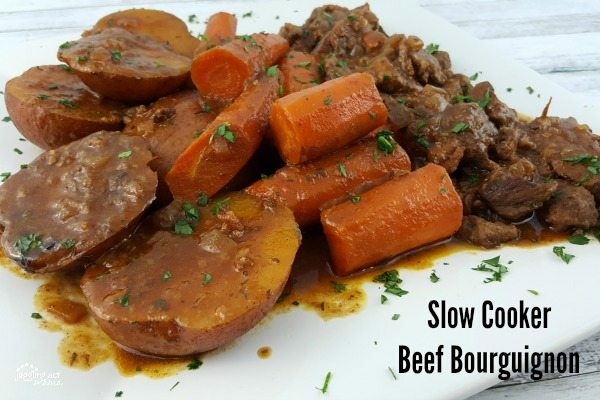 What Do You Have with Beef Bourguignon? Some recipes call for beef Bourguignon to be served over mashed or boiled potatoes. Including the potatoes in the slow cooker saves that step. Instead, serve this dish just as it is with slices of crusty French bread on the side. Slow Cooker Beef Ragu – Simply Whisked – As a kid, I avoided all forms of tomatoes. Now, married to an Italian, I’ve grown to love a hearty tomato sauce like this one. 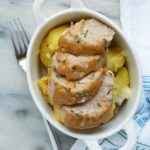 Slow Cooker Pork Tenderloin – Tastes of Lizzy T – I grew up eating slow cooker meals on Sundays, especially pork tenderloin. This recipe is almost as good as my moms! Oh this looks delicious! The sauce it makes lookks so this and rich! 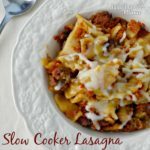 I have made this in the oven but never used my slowcooker! No babysitting the pot? I’m in!! So good! And who has time to babysit the stove, right? ?